Central Park hosts concerts during the spring, summer and fall, ranging from small classical quartets at the Naumburg Bandshell to large rock concerts on the Great Lawn. To enjoy live music in Central Park, check out the many options below. Rumsey Playfield – a hot spot for music, dance, spoken word and film as the home of the popular SummerStage cultural series. Curtis Mayfield, Toni Morrison, the Beastie Boys, and Vampire Weekend are a few of the world-renowned and emerging artists who have performed here. The Naumburg Bandshell hosts principally acoustical music events, like the Naumburg Orchestral Concert series. This free series features classical music throughout the summer. Some of the biggest names in music have come to the Great Lawn, continuing a glorious New York tradition of memorable performances set under a star-filled sky. 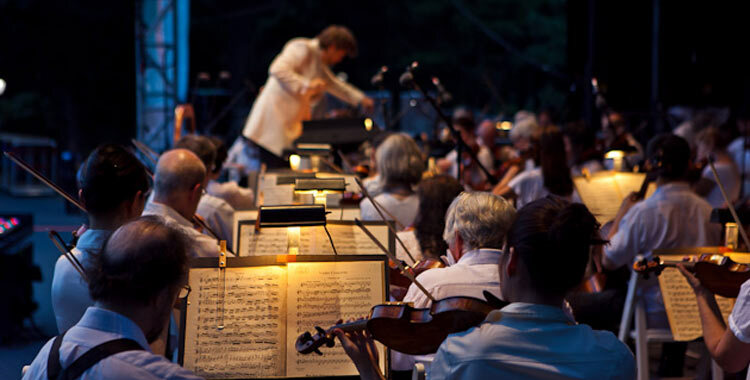 Artists include the New York Philharmonic, often led in the 1980's by the late, great Leonard Bernstein; the Metropolitan Opera with such musicians as the three tenors Luciano Pavarotti, Jose Carreras and Placidio Domingo; Andrea Bocelli in 2012; and rock stars Elton John (1980), Diana Ross (1983), Paul Simon (1991), Dave Matthews (2003), Bon Jovi (2009), and the Black Eyed Peas (2012).